The name ‘Vindaloo’ is derived from the Portuguese dish “Carne de Vinha d’ Alhos” which is a dish of meat, usually pork with wine & garlic. The Portuguese dish was modified by the substitution of vinegar (usually Palm Vinegar) for the red wine & the addition of red Kashmiri Chillies with spices to evolve into Vindaloo. The alternative terms are Vindalho or Vindallo. 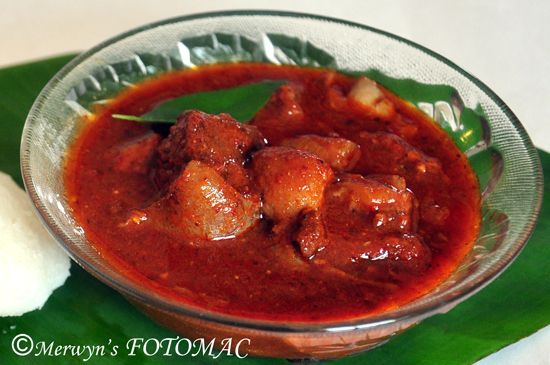 Traditional Goan Pork Vindaloo is intensely flavored with fragrant spices & does not include potatoes. Cut & dice the pork into desired pieces & clean by washing in some diluted vinegar. Then rub in the prepared masala paste into the pork pieces & allow it to marinate for a few hrs. or overnight in the fridge. Heat oil in a sufficiently deep, wide & heavy bottomed pan. (I used a pressure cooker). Throw in the curry leaves & fry for a few seconds. Add the meat & fry till oil starts separating. Add the reserved masala water from the grinder & stir well. Pour in enough water & allow to cook on a slow fire, until the meat is cooked well. If you use a pressure cooker then pressure cook for about 4 whistles. Let the cooker cool on its own. If the meat is not tender then pressure cook for another 2 whistles. Use your judgement for this. Adjust salt, sugar & vinegar to taste. 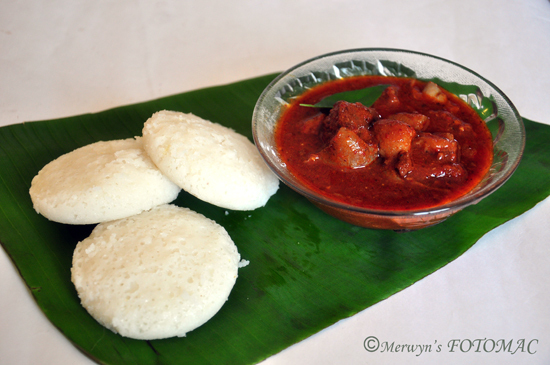 Serve hot with plain steamed rice, bread of your choice or with Sannas. You may make fresh tomato puree & add it when you are frying the meat instead of grinding it along with the masala. You may chop & fry the onions & then add the masala paste to it instead of grinding them with the masala. You will know that the Pork Vindaloo is ready when the gravy is fiery red in color & the curry/gravy gives out a wonderful aroma of cooked spices & vinegar. The Pork Vindaloo tastes better the next day if you allow the meat to marinate in the gravy. The longer you allow the flavors to meld & store it for a longer period, it will taste even better… just like pickle! If you like the vindaloo very spicy then grind the chillies along with the seeds. Wow spicy,authentic recipe..thanks for sharing..